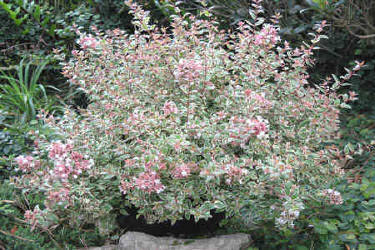 Dark pink buds open to light pink Blooms which age to soft white. Attractive variegated foliage new shoot emerge a soft salmon pink, aging to green with a white margin. Best grown in full sun. Will tolerate all but heavy, poorly drained soils. Tim back as required to maintain tidy growth habit.